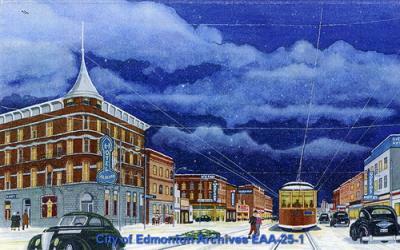 Find out about City of Edmonton Archives' current events and activities throughout the year. Turner'​s paintings portray Edmonton based on archival photos from our collection, as well as how he recalled the city as a youth in the 1940s. His intent is to portray his paintings in a manner that is pleasing to the eye, and hopefully satisfying to those who want to ponder the past. Many of his works were turned into Christmas cards, and were accompanied by an artist’s statement, consisting of a narrative of the history of the scene and his reminiscences.​ ​Reg Turner has donated much of his work to the City of Edmonton Archives (MS-152). This exhibition of his work is a chance for us to look back at the Edmonton that was through the artistic and written record provided through this fonds. 2017 was Canada's Sesquicentennial! We celebrated with trivia and exhibits, see our Canada 150 at the Archives page for details. We offer behind the scenes tours of our vaults as part of Doors Open Edmonton in July and Free Admission Day in September. City of Edmonton Archives tour in 2005. Throughout the year, archivists at the City of Edmonton Archives offer courses on topics ranging from how to use the Archives for specific projects (like researching your house) to how to preserve your personal records. We do this to share our knowledge and raise awareness of the Archives at the same time. FAD is held on the last Sunday in September. It's a city-wide event with free entry and special events at many of Edmonton's recreation facilities and attractions, including leisure centres, the Edmonton Valley Zoo, and us. Because we're always open to the public without charge, we celebrate the day with tours, family activities and door prizes. We're lucky to have some great organizations sharing the Prince of Wales Armouries with us and they participate in FAD as well. We contribute to the City’s social media outlets like Twitter and Facebook and we also write blogs for Transforming Edmonton. Our most popular blog highlights Woodward's impact on Edmonton and sports fans will love our blog on Edmonton Eskimo Scrapbooks. We launched our first virtual exhibit in 2012. Our award winning exhibits tell stories about Edmonton and Edmontonians using the records at the City of Edmonton Archives. Posts featuring images and documents from the Archives collections.